Hurt in a Cargo Ship Accident? Cargo ships are essential to the global economy. They transport goods like fuel, food and consumer items all across the world. However, if boat owners or shipping companies neglect safety procedures or fail to ensure the vessel is seaworthy, working on a cargo ship can be dangerous. Improperly secured containers or products may shift, resulting in catastrophic injuries like amputations or even wrongful death. In addition, a poorly maintained vessel may be prone to explosions, mechanical malfunctions and capsizing. Our Jones Act attorneys understand how devastating a cargo ship accident is to your health and you career. Although maritime laws do include protections for injured maritime workers, big shipping companies often try to deny injury claims or offer low settlements. Our team of lawyers and investigators can help you stand up for your rights or the rights of a loved one. In the past, we have obtained multi-million dollar verdicts and settlements for maritime workers hurt on cargo ships and other seagoing vessels. We never back down from a fight and will aggressively argue your case in the courtroom when necessary. What are the Most Common Cargo Ship Accident Injuries? Additionally, burn injuries and other accidents may result from improper ship maintenance. Any of these injuries could result in lifelong conditions or disabilities that may prevent you from returning to work. The International Safety Management Code (ISM) includes regulations intended to prevent serious cargo ship accidents at sea. However, shipping companies may neglect ISM requirements in the interest of making a profit. If you are hurt on a vessel that is not in compliance with the ISM Code, then our Jones Act attorneys can help. What Happens if I Am Hurt in a Cargo Ship Accident Overseas? Under general maritime law you are entitled to maintenance and cure benefits from your employer. This means that your employer must pay a daily stipend based on your basic living expenses as well as your medical expenses. This often includes the cost of medication, therapies and specialist treatments. 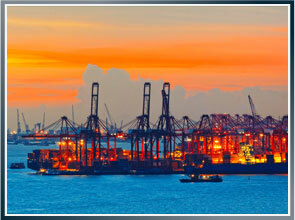 If you receive medical help while in a foreign port, maritime liability laws can be confusing. However, our Jones Act attorneys can help sort through these legal complexities and get you the compensation you deserve. If your loved one suffered wrongful death as a result of a cargo ship accident, the Death on the High Seas Act may apply to your case. This act allows you to seek compensation for lost income and other damages. While money cannot make up for the loss of someone you love, it can help relieve your financial burdens. No matter where your cargo ship accident occurred, our Jones Act attorneys can help ensure that you get the benefits you deserve. Big shipping companies often try to intimidate or ignore injured maritime workers. We can help you fight back. Contact our maritime law firm online or call our offices to schedule a free consultation.